New Scotland Yard by Allford Hall Monaghan Morris – Embankment, central London, England – Workspace/office- is one of winners announced for the London region. AHMM selected to redesign London’s new police headquarters. They beat four others, namely Foster and Partners, Allies and Morrison, Lifschutz Davidson Sandilands and Keith Williams Architects. Key design is clearly aimed at transparency and engaging with the public, a positive move for an arm of the establishment in a mature democracy. Thankfully the famous revolving sign, Eternal Flame and Roll of Honour will all be incorporated – a good blend of tradition and innovation. Renowned architects Allford Hall Monaghan Morris (AHMM) have been chosen to redesign London’s new police headquarters, it was announced today by the Mayor of London, Metropolitan Police Commissioner and the Royal Institute of British Architects (RIBA). The Mayor’s Office for Policing And Crime (MOPAC) is selling the current Metropolitan Police Service (MPS) headquarters, New Scotland Yard, and moving to more modern, cost effective offices at the iconic Curtis Green building on the Victoria Embankment in 2015. This will then be known as Scotland Yard. A world-class field of architects responded to the RIBA design competition, launched in May 2013, to find the most suitable and financially viable proposal for the building. AHMM’s winning design envisages a police headquarters that will be more open and accessible and will help the Met to reconnect with the public, whilst respecting the heritage of the Whitehall Conservation Area in which it is sited. Key design features include a new public entrance pavilion, extensions to the building itself and the creation of public open spaces. The world-famous revolving sign will be retained as well as the Eternal Flame and Roll of Honour, currently located at New Scotland Yard in Victoria. AHMM is an international architecture practice based in the UK with experience of working on a number of major buildings in the UK and abroad. They are currently undertaking a masterplan and redevelopment of the BBC television centre in White City and were recently announced as the architect for the new Google headquarters at King’s Cross. AHMM worked with specialist architects Haverstock to advise on the proposals. The redevelopment of the Curtis Green building forms part of the largest ever transformation of the police estate to provide a more modern, efficient, secure and cost-effective estate – ensuring the MPS remains at the forefront of 21st century policing. The cost to the Met if they were to remain at NSY would be around £30 million, with £50 million additional spend needed for it to meet the specifications for a modern policing operation. By moving to the new site and cutting costs, the Met are able to invest in frontline policing, helping to keep officer numbers high, improve the technological capability of the force and develop facilities like a brand new, state of the art police training centre in Hendon. The Met will now work with AHMM to develop the designs further before a planning application is submitted in 2014. Completion of the site is expected in 2015. MPS Commissioner Sir Bernard Hogan Howe said: “Scotland Yard is an internationally recognised and highly respected brand and the architects final designs for the building will, we hope, reflect and enhance this status. 30 July 2013 – The Royal Institute of British Architects (RIBA), the Mayor’s Office for Policing and Crime (MOPAC) and the Metropolitan Police Service (MPS) are delighted to announce the shortlist for the design competition to create a new central London HQ – replacing their existing New Scotland Yard building. Roger Harding MPS – Director of Real Estate Development said: “The competition generated considerable interest with the chance to create a new landmark building for London. We would like to offer our sincere thanks to the world class field of national and international award-winning practices who submitted expressions of interest. The selection process was exceptionally difficult but we are delighted to have five such high quality architects on our shortlist for this important building. The new HQ, to be called Scotland Yard, will involve the redevelopment of the existing and currently unoccupied Curtis Green MPS building located on the Victoria Embankment, London, SW1. The Curtis Green Building, named after architect William Curtis Green, sits within the Whitehall Conservation Area between the Norman Shaw Building and the Ministry of Defence. It faces onto the Victoria Embankment with views across the River Thames to London County Hall, Westminster Bridge and the London Eye. The shortlisted teams will now work on their design proposals and will be invited to present these to the judging panel in September 2013. The Royal Institute of British Architects (RIBA) is delighted to announce the launch of a new design competition on behalf of the Mayor’s Office for Policing and Crime (MOPAC) and Metropolitan Police Service (MPS) to create a new central London HQ – replacing their existing New Scotland Yard building. 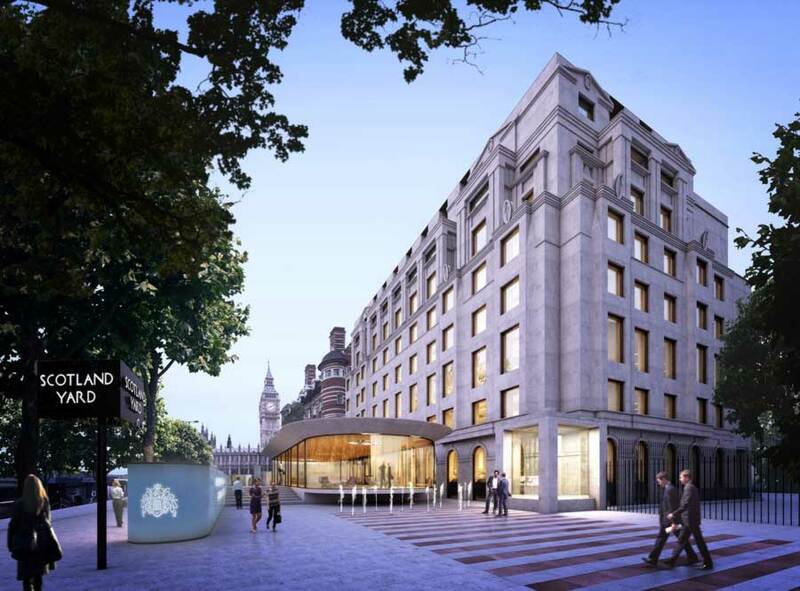 The new HQ, to be called Scotland Yard, will involve the redevelopment of the existing and currently unoccupied Curtis Green MPS building located on the Victoria Embankment, London, SW1. The Curtis Green Building named after architect William Curtis Green sits within the Whitehall Conservation Area between the Norman Shaw Building and the Ministry of Defence. It faces onto the Victoria Embankment with views across the River Thames to London County Hall, Westminster Bridge and the London Eye. The Invited Design Competition provides architects/practices with the opportunity to produce a design for the renovation of this landmark in one of London’s most important and historic areas – to provide a modern, flexible and secure office environment for the MPS. The Curtis Green redevelopment will provide a state-of-the-art HQ for the MPS that also respects the heritage and location of the building and the need to deliver value for money for the MOPAC and the Met. The original building, constructed as an annexe to the original New Scotland Yard, had no significant front entrance. A new modern, efficient and highly visible entrance and reception will be an important part of the design. Expressions of interest (EOI) are sought from architects/practices worldwide, following which up to five architects/practices will be invited to develop concept designs for the project. Each of the short-listed architects/practices will receive an honorarium payment of £6,000 (+VAT) and be invited to present their proposals to a Judging Panel at a final assessment. The Judging Panel will include architect Bill Taylor, Taylor Snell acting as the RIBA Adviser. For further details about the Curtis Green Metropolitan Police Service New HQ Building and how to register for the competition please visit www.architecture.com/competitions and follow the link to Live Competitions. Deadline for receipt of expressions of interest is 2.00pm on Thursday 27 June 2013. The Curtis Green Building (1935-40) was designed by William Curtis Green architect as an annex to the former New Scotland Yard (now the Norman Shaw building). It was occupied by the MPS after the Second World War to house the MPS forensics and other technology departments. It became in due course a police station, before (1985) becoming home to the HQ of the MPS territorial police organisation until the building was vacated in 2010.